• A beautiful photography book by Nigel Stewart looking at the Normandy War Cemetaries. Normandy, North, South, East and West, has numerous war cemeteries, mostly from World War Two but also from World War One. The coastline of western Normandy, through the history of one pivotal day - D-Day June 6th 1944, has made it one of the most visited tourist destinations in Europe. Along the coast are found several war cemeteries that are well known and easily accessible. The Normandy American Cemetery, above Omaha beach, averages around 1.5 million visitors a year. Nearby, the Commonwealth cemeteries of Bayeux, Bény-sur-Mer and Ranville, as well as the German war cemetery atLa Cambe, are also busy places in the summer months. 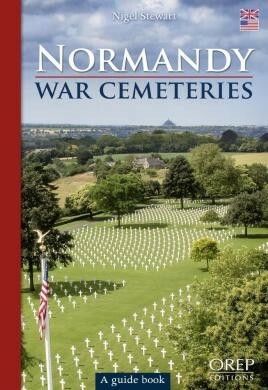 For seven months Nigel travelled to all corners of Normandy to photograph these cemeteries.The book helps the reader locate andvisit not just those well known warcemeteries, but also those which are less well known, more numerous. GPS coordinates are included inside this book, alongside each war cemetery described.As well as photographs of these well maintained resting places of young combatants, several individuals from different nations are featured to emphasize the stories of young lives from the different countries.These cemeteries have matured into gardens, beautifully maintained by thedifferent Commissions. Peaceful places…such a contrast to what created them. Lest we forget.